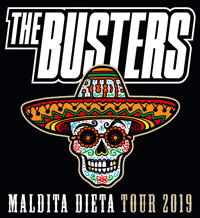 See The Busters live and in colour – of course without all those annoying ring tone commercials? Live-Video - from the current album SUPERSONIC ESKALATOR. Music Video - from the current album SUPERSONIC SCRATCH. Music Video - from the current album SUPERSONIC ESKALATOR. Music Video - from the album "Supersonic Eskalator". Our travel report from the Venezuela ride in June 2011. The Busters in Venezuela - Gallery! Picture-Gallery from our Venezuela ride in June 2011. Desorden Público feat. The Busters (Live in Mainz, Germany 2011-06-27). From the Special Double Feature DVD "Das Konzert für die Ewigkeit". Making Of from "The Concert for Eternity" on May 15th, 2010. Directors: Jonas Grosch and Matthias Matek Hofmeister (http://www.resistefilm.com). The Concert for Eternity (Trailer)! Trailer for the Special Double Feature DVD "Das Konzert für die Ewigkeit". A Band for Eternity (Trailer)! Trailer for the band docu "Eine Band für die Ewigkeit", which will contained on DVD 2 of the upcoming Special Double Feature DVD "Ein Konzert für die Ewigkeit" (Release: 01/21/2011). Press conference "Waking The Dead"
Official press conference by The Busters to the release of their new studio album "Waking The Dead" (in stores November 13th 2009). The Busters and German actress Katharina Wackernagel recording the O.S.T. for the German movie "Résiste! - Aufstand der Praktikanten". The Busters in the Studio, recording their new record "Waking The Dead" (Out: November 13th 2009). Live-Video, taped in Saarbrücken on February 4th, 2009. The Busters with Mathias Demmer on sax (4:32). The trailer for the 1st ever THE BUSTERS DVD. 10 new arranged songs, 12 well dressed musicians, 1 brand new CD with DVD (1:05).